The siege of Pale ends with the devastation of the famed Bridgeburners and the decimation of the Malazan Army’s mage cadre. Stunned by these events, the survivors suspect they have been betrayed by members of their own armies. Tattersail, the surviving mage, enters into a bargain with Sergeant Whiskeyjack and his surviving men to uncover the truth. On the other side of the world, in the heart of the Malazan Empire, an entire section of the coast, several villages, and an army have been massacred. A young officer, Ganoes Paran, and the Adjutant of the Empress embark on a trail for the culprit that leads them to Pale and to a member of Whiskeyjack’s own squad. In the city of Darujistan, the last of the Free Cities of Genebackis not conquered by the Malazan Empire, politics flare as some wish to capitulate to the Empire and others seek an alliance with the mysterious Anomander Rake who nearly single-handily stopped the Empire’s siege of Pale. In this city, a young thief named Crokus is about to be a pawn of the mischievous gods of luck while an assassin’s war explodes through the rooftop. In the city of Darujistan, all these disparate characters meet, converge, and clash as Malazan Book of the Fallen begins. I have never read a fantasy series like Erikson’s Malazan Book of the Fallen. History breathes in his books. You have the feeling that you are in the middle of some grand epic. Characters have rich backstories that would make an interesting series, and this is just the start of one new chapter in their varied histories. Gods, powerful Ascendants, lowly mages, undead warriors, thieves, and more. It is like a D&D campaign on crack. Erikson pulls all these various characters, dozens of them, with their own goals. Each is a rich character brought to life. They clash, merge, and explode apart in ways you can’t imagine. It is a breathtaking read that keeps you turning until the converging climax. Thus starts Malazan Book of the Fallen, the annals of the dead soldiers of this vast empire as its activities span the world as they challenge gods, dictators, and corruption within their own nation. 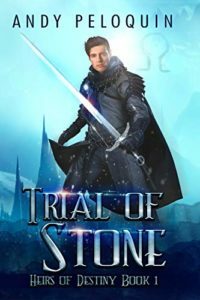 This military fantasy is one of the best out there. 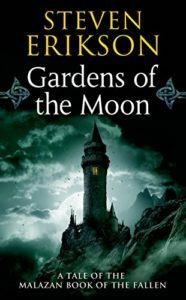 You can buy Gardens of the Moon from Amazon!